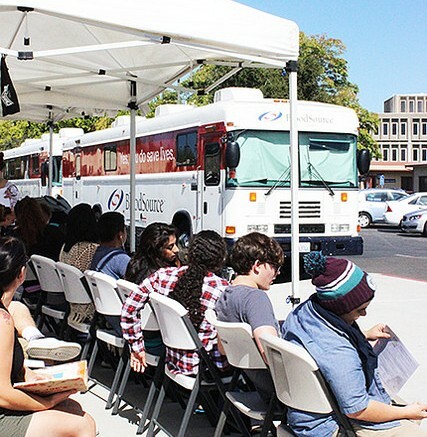 Blood Source came to American River College on Sept. 29 and Sept. 30 in hopes of getting students to save lives by donating blood. Blood Source is a full service blood bank that caters to 40 hospitals throughout the Central and Northern California area. The blood drive is sponsored by the ARC Health Center. “Giving blood is a great way to give back and save lives,” said Blood Source volunteer Bill Dow. This year Blood Source was set up at two locations on campus, in Parking Lot B next to the Student Center and in the parking lot in front of the parking garage. Blood Source decided on being at two locations this year so it would be more convenient for students to give blood. The location by the parking garage was busier but many students, at the Parking Lot B location, said they would not have given blood if they had to walk over to the other location. “It’s a good thing to do. It makes me feel like a decent person,” ARC student Carly Williams said about the experience. Donors received a free t-shirt and snacks after giving blood. “People like to come in for the snacks. When I ask people why they give blood most of the answers I get are for the snacks not so much for the t-shirt or to save lives,” Dow said. Blood Source was also trying to get volunteers for their “Be the Match” program which is for bone marrow donation. To donate, one must be between the ages of 18 and 44 and ready to donate whenever someone is in need. A lot of people only give blood when Blood Source comes around to ARC because of the convenience; it is something that students can easily do between classes. “I’m giving blood because, why not? I was here to turn in homework and walked by and just decided to because it was convenient,” ARC student Alex Mackey said. Be the first to comment on "ARC students help save lives"